A vital component of the APS-U are the Feature Beamlines, a set of new and upgraded beamlines designed to allow researchers to fully exploit the extremely bright X-ray beams from the APS-U storage ring. Beamlines employ highly sophisticated technologies, such as atomically smooth mirrors, monochromators with state-of-the-art cooling, and sample positioning with nanometer resolution. Each beamline’s equipment tailors the X-ray beams to the researchers’ needs for a wide variety of experimental uses. Polar: The Polarization Modulation Spectroscopy Beamline enables studies of materials at the mesoscale to detect electronic/magnetic differences by means of tuning and controlling competing ground states under extreme high-pressure conditions (in the megabar range). Brilliant, polarized beams open remarkable opportunities for discovery of new phases and furthering our understanding of quantum matter. The PtychoProbe Beamline realizes the highest possible spatial-resolution X-ray microscopy both for structural and chemical information, with a goal of focusing an X-ray beam to a 5-nanometer spot and the capability of ultra-fast scanning of the beam across the sample being studied. Scientists will have unprecedented capabilities to accelerate the discovery of complex materials and establish the APS as the go-to place for hard X-ray, high-resolution microscopy. The 3D Micro and Nano Diffraction Beamline attacks a wide range of problems in materials science, physics, and geoscience. The new APS will provide small, intense X-ray spots (between 50 and 200 nanometers) to investigate spatial variations and correlations of strain and structure that define a wide range of scientifically and technologically important materials. 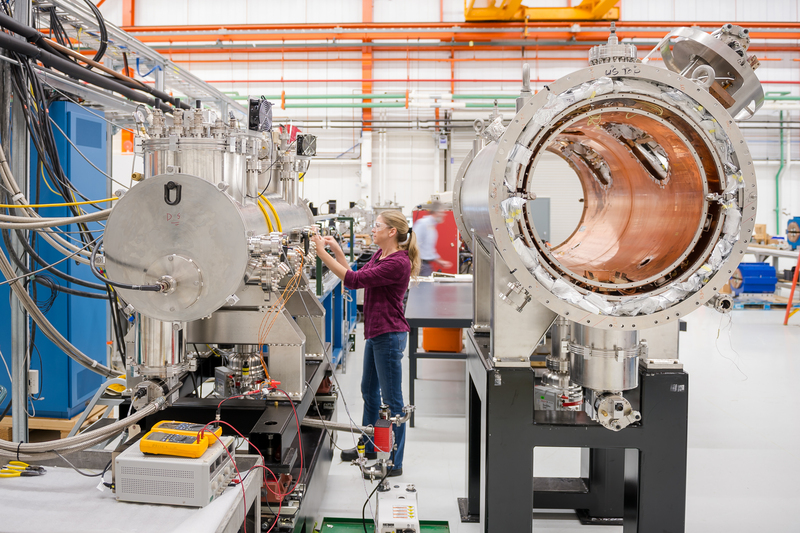 The ATOMIC Beamline uses the enhanced coherence of the APS-U x-ray beam for high-resolution studies of the structural, chemical, and physical properties exhibited by advanced functional materials. There is a strong need for a single technique that can acquire atomistic structural information across many length scales in full three-dimensional detail. Coherent diffractive imaging at ATOMIC combines that capability with in situ and operando environmental cells to have a transformative impact on many disciplines of science. The CHEX Beamlines use coherent x-ray techniques to advance the frontier for in situ, real-time studies of advanced materials synthesis and chemical transformations in natural operating environments, employing condensed-matter physics and environmental science. This research promises breakthroughs in discovering, developing, and understanding the materials and processes needed to address global challenges in energy, environment, health, and security. The High-Energy X-ray Microscope Beamline investigates structure and evolution within bulk materials, often in extreme environments, with the established high-energy X-ray scattering techniques and novel coherence-based techniques enabled by the upgrade of the APS. Materials subjected to these techniques are of relevance to a large range of subjects, including: mechanical engineering, biophysics, irradiation/nuclear energy, energy storage, and advanced manufacturing. The In Situ Nanoprobe Beamline is a nanoprobe instrument designed to have a relatively large optical working distance. This enables investigation of complex functional materials and materials systems such as catalysts, batteries, photovoltaic systems, and nanoscale Earth and environmental samples, during synthesis, operation, and under actual environmental conditions. The beamline is designed to study these systems across many lengths scales, in two and three dimensions under in situ conditions. The X-ray Photon Correlation Spectroscopy Beamline advances studies in key areas in physics and materials science and engineering, including dynamic heterogeneity, structural dynamics in super-cooled liquids, and fluctuations associated with competing mesoscale interactions in emergent materials. Correlation techniques are sensitive to the square of the brilliance of the photons, so the more than 100X increase in the APS-U brilliance will lead to a more than 10,000X increase for this technique. The beamline enables dynamics-related studies in areas as diverse as in situ rheometry, nano-fluidic flow, and high pressure, and advances their potential applications in an array of technologies, from energy and transportation to health, agriculture, and national defense. The Coherent Surface-Scattering Imaging Beamline is ideal for probing and understanding mesoscopic space-time correlations. The beamline will combine a surface X-ray probe with state-of-the-art X-ray optics and detectors to study a range of materials surface and interface phenomena. These include the evolution of biological membranes and complex molecules in aqueous environments; thin-film and quantum-dot growth at surfaces and interfaces; assembly of polymer nanocomposites; and structural analysis of three-dimensional, nanoscaled electronic circuits using additive manufacturing.